You guys…my office mini-makeover is coming along (check out my gold & marble shelving units, coral closet doors, closet system, and coral curtains), and now I have a new rug that feels so silky and delicious (yes, delicious!) under my toes. I adore the Nourison Graphic Illusions rug I’ll be featuring in this post. 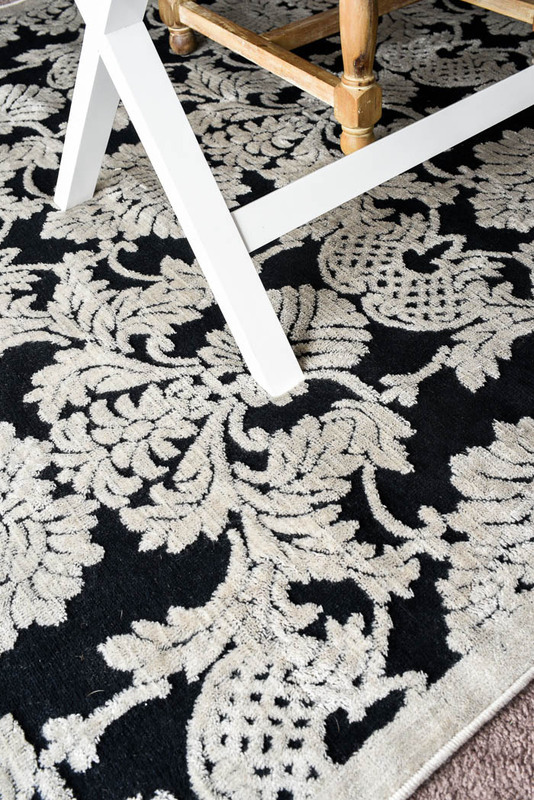 This is an affordable damask rug that you can snag for about $125 or so (sometimes less). If anyone knows me, or if you’ve been reading for awhile, you all know I LOVE me some damask (I used it ALL over my May 2009 wedding). I spent hours upon hours looking through rugs online, and I kept coming back to this rug. Finally I decided that I should stick to what I like– I knew I wouldn’t get tired of this rug ever. Ever! 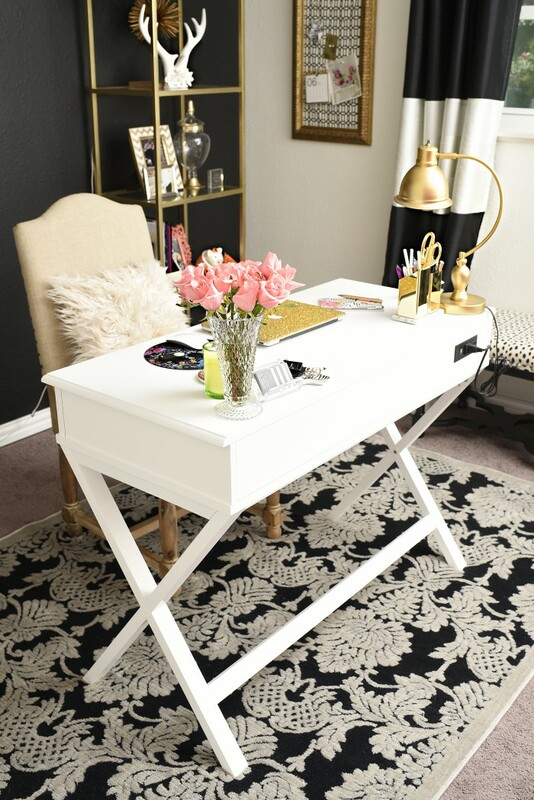 Now I know it may seem odd to put a rug on carpet, but I wanted to define the desk area to anchor the center of the room. I’ll eventually get a larger 8×10 natural fiber rug to put under it for a chic, layered look. Bottom line is that I don’t think putting an area rug over carpet is redundant in a home. It can add color, pattern, texture and style AND define spaces. I opted for a 5×8 black damask rug since this whole entire room is about 10×10, so it does surprisingly take up a decent amount of real estate. It’s not black and white though. I’d describe the color as a silvery/taupe color with a black background. It is chic, high quality and when I rolled it out it lay flat within a few hours. There’s also a gray damask version of this rug which is great if you want something a bit more neutral. Excuse the dog hair in the above photo, but Pee Wee loves laying on this rug while I blog. He’s the best company and loves naps. 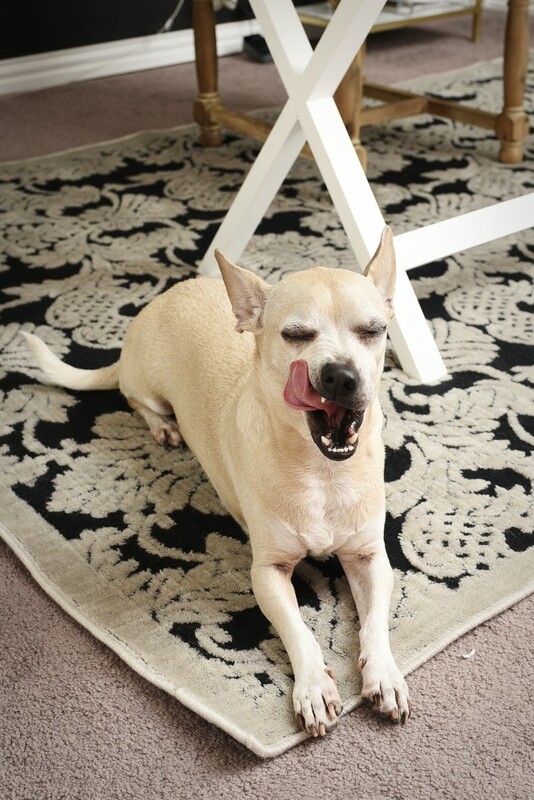 He, too, thinks this rug is deliciously awesome. The weave makes it impossible for Pee Wee’s nails to ruin this rug like he ruined the one I previously had in here. Overall, I love the pattern, texture/warmness, and luxe feeling it adds to the space. I am wanting a large one for the guest room now. I love it that much. Lots of bang for your buck if you can snag the rug when it’s on sale. 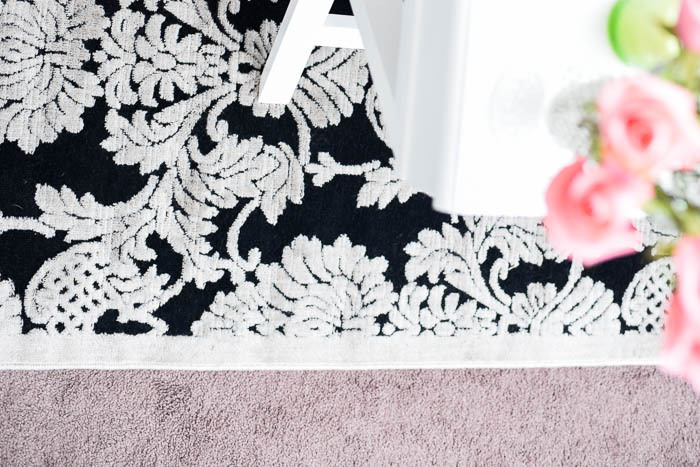 If you know your style well, and you have a pattern/color you love, then buying a rug online can save you hundreds of dollars. The other rug I bought is going to BLOW YOUR MIND because it’s so not a Monica rug. I went totally left field, so you’ll have to stay tuned to see what it looks like. Hopefully the hubby can help me move the sofa this weekend to get it situated. 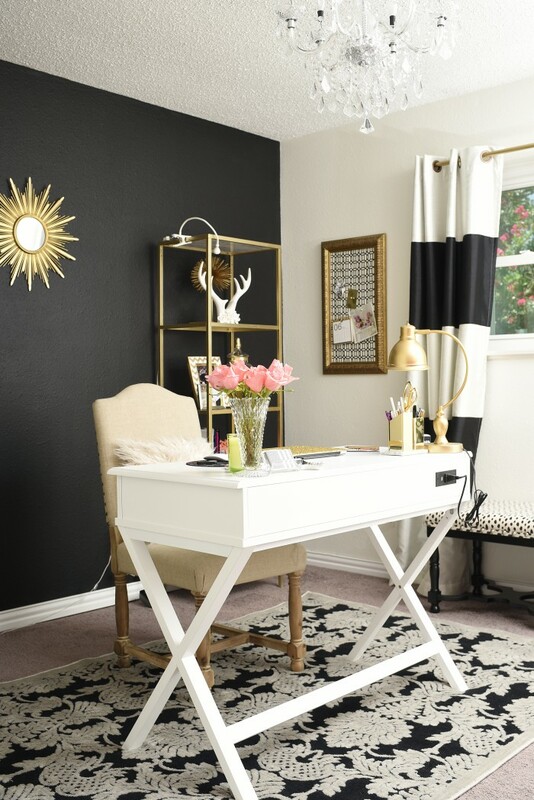 Now if I could just find a desk chair, this mini-office makeover could be done. Anyone know have any recommendations for a pretty and functional office chair? I love the makeover. Can I ask where you purchased that desk? Hi there! The desk is from Big Lots. Just when I was so in love with your office, now you just made me fall even more in love! Oh wow, I love your office and this rug is definitely the perfect choice. It looks amazing.